Perfect building location with an absolutely Stunning view. Parking was easy and located close to unit. Beds were great for comfort and the overhead fans made sleeping a breeze. We loved the code for entry into the room and pool with no need to keep track of a key. No disappointments. Better than expected. It was a wonderful stay. Everything was clean, in working order, pleasant. Excellent people to work with. It was the perfect home away from home. Had everything we needed and more! Positives: WOW! what a view! The condo is clean, roomy, well and decorated. I am not a fan of sitting on sleeper Sofa's. Squeaky and not as comfortable as a "non" sleeper sofa. With that said, It leaves more options for larger groups if extra sleeping room is needed. The only other issue was the AC Temp. changed on us twice during our stay with no input from us. Both times the temp. dropped to 66 degrees.. Then on our checkout day, it stopped all together resulting in 75 degrees and muggy. I assume this was all due to a controller issue and not someone changing the temp from a remote location. These are minor nit picks. This is a wonderful property and a joy to stay in. We would come back. The best thing about this place, other than the lovely view, the excellent accommodations, and the proximity to the beach, was Thomas Duffy, who was our Concierge for our stay. He arranged helicopter flights, tubing, zip lining, and snorkeling for us. Every single provider treated us wonderfully and we had an absolute blast! We lived the condo. It was top notch. We always recommend people to this place. However, the no longer heat the pool so we won't recommend this place any longer. The oven in the evenings. Awesome, nicest place we’ve ever stayed on the islands. Beautiful room and even better view! Kauai Exclusives was great and the room was amazing! Had everything we needed for our stay and the resort was in the perfect location to be able to enjoy both north and south parts of the island! Would recommend to anyone and will be staying here again! This is an easy 5 star rating. We had a wonderful family reunion at Waipouli Beach Resort in June of 2017 (13 family members in 4 condos). This review specifically pertains to A402 although it generally applies to the other units we rented (A304, A301 and A206). The bike path: It begins at the Waipouli parking lot. We rented bikes from Kauai Bikes (two blocks away) and daily rode to the northern end of the path and then to the Lydgate Park to the south (17 miles round trip). 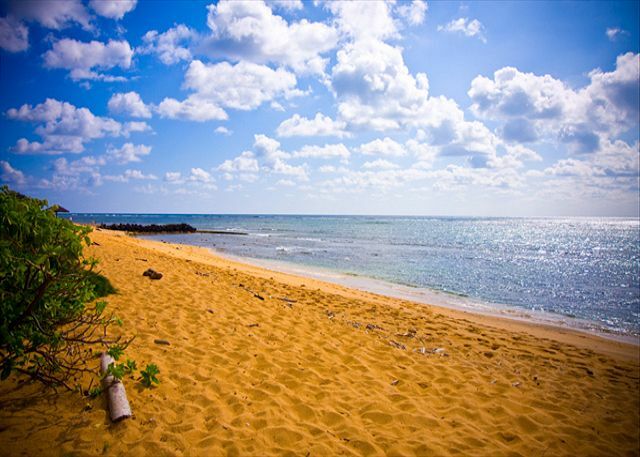 Kauai Exclusive concierge service: John Leonard helped us arrange activities to suit each family member. He was a pleasure to work with, he had great suggestions and saved us money. Restaurants: Many good restaurants in Kapaa, including the Oasis right at the Waipouli. 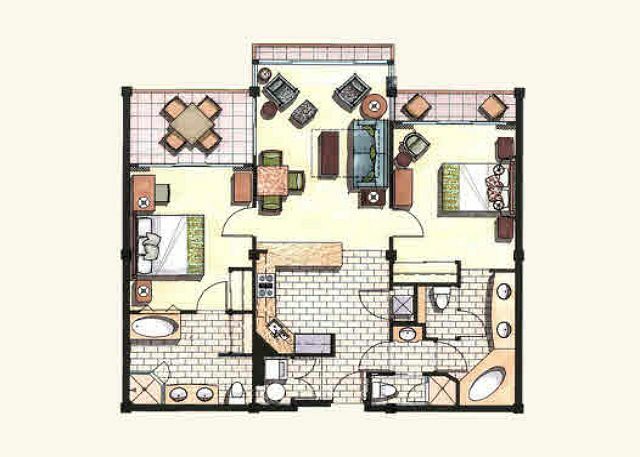 The Condos: Each were clean, modern and spacious. Kitchen: Modern, high-end appliances and ample dishes and silverware (only missing an ice cream scoop). The Ocean View: It was terrific and mesmerizing. The Ocean Sound: It put us to sleep every evening. The Ocean Breeze: We kept the sliding glass doors open and had a wonderful cross breeze throughout the condo and didn’t need the air-conditioning. (The air-conditioning works great if you want it). Extras: There were three boogie boards, cooler chest, beach umbrella and some snorkeling equipment. The swimming pool: It is terrific for kids and adults alike. The pool area includes three large hot tubs/spas with sandy bottoms - very nice. The traffic right outside the Waipouli parking lot was sometimes quite slow, but it generally didn’t last more than a few blocks. The beach at Waipouli is pretty but not ideal for swimming. We would definitely come back and recommend it highly. We loved this condo and the location, best view I have had on my Hawaiian vacations over the years! We loved the town of Kapaa, shaved ice at Hee Fat is a must! A blender and more than one beach towel would have been nice to have in this condo, other than that we had a wonderful stay. This condo was fantastic. Kauai Exclusive's staff was a phone call away when needed; Sonja and Josh in particular. Perfect location at the Waipouli Beach Resort. Beautiful view and everything needed was in the condo upon arrival. We hope to return again! Mahalo! The condo was beautiful, clean, had amazing views and plenty of amenities. There was snorkel gear, sand toys and boogie boards. High end appliances. Plenty of dishes/pots/pans. It was very spacious, and the pool/hot tub were great. It is in a great location (walk to grocery stores), and has an incredible on site restaurant (Oasis). Kauai Exclusives was incredibly organized and helpful in finding the right rental for us. Waipouli Beach Resort was an ideal choice. Great location, clean and friendly, excellent pool, and the Oasis restaurant make this vacation rental fantastic. We rented a two bedroom condo. It was well-equipped, clean, and comfortable. We had great ocean views. I would stay here again in a heartbeat! We had a great time. Room was super clean and comfortable. Best part...views. Great pool for the kids. Location worked perfect. Safeway close. Easy to go North or South. The online property description is spot on. 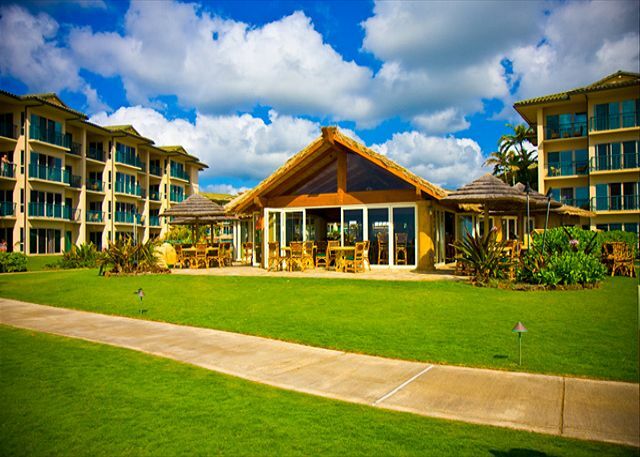 Terrific location in beautiful Waipouli resort. Clean, well-maintained unit with modern kitchen. We had one small problem which was fixed immediately by the manager. Waipouli has a large pool, three Jacuzzis, and an accessible beach. 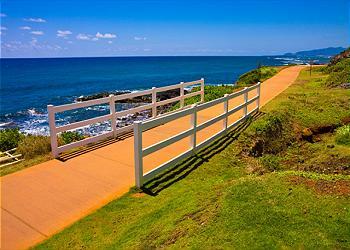 Perfect location for a drive to Kilauea Lighthouse, Limahuli Gardens or other North Shore attractions. Many great restaurants nearby including the ever-popular Kintaro. I highly recommend the property. We were told we would have "exclusive" wi-fi but that wasn't the case when we first arrived. After a couple of phone calls on Sunday & Monday with no real action or results, I finally got a hold of Sherri Gunn who got the problem resolved. It would be nice to have a list of TV stations available and what channels they were on. Other than these two relatively minor, although somewhat annoying, issues the property was very nice and the location was excellent. The condo was great and the grounds were gorgeous! I would like to stay here permanently! Beds were comfy and the patio was so relaxing. Would definitely go back! This property had everything we were looking for in a Kauai condo rental: really nice pool, bar near the pool, close to the ocean, easy to visit each side of the island as a morning trip, close to restaurants, and nice fixtures and amenities in the unit. The staff was great. Everyone was helpful and kind. If we go back, I don't think we'd look at staying anywhere else. Had an amazing stay in suite A402. Room was very clean and well stocked. It had everything you would need from kitchen supplies to beach stuff. Amazing views of the beach and ocean. Management company was very accommodating and was available to answer any questions we had. I highly recommend staying here. We will be back. It was a wonderful location and had everything we needed. Very quiet and beautiful view. It was wonderful to have breakfast on the lanai and overlook the ocean. Luxury condo, perfect for 1 or 2 couples, gorgeous oceanfront view, quiet yet close to the pool, beach and Oasis restaurant (you must try the pork wontons - yummy). High end large kitchen, great to cook in and look at the ocean while doing so. Safeway right across the street and BBQs onsite which was very convenient. Highly recommend this condo! A lovely unit in a very well run and beautiful complex. Initially the area seemed a little less "High end" , but once in the complex unit A402 feels wonderful and the area proved ideal for shopping as well as an excellent base from which to explore all of Kauai's interesting sights. A402 is excellent and I could not fault the very helpful management, the best I have ever dealt with! The only two minor items in the unit were a mattress cover that needs replacing as it was stained and some ovenware and serving dishes. Had I contacted the managers, I am sure they would have fixed the problem, but this review will likely fix this minor irritation. I would not hesitate to recommend this unit and the very child friendly complex. This is an outstanding property. It is very quiet and well kept. The views are spectacular and the property is well maintained. Everything you need is in the condo. Highly recommended. The room was perfect! I do wish someone would rake the beach, but overall, wonderful. Cant say enough great things about our stay, this beautiful condo, resort, people and island! LOVED it so much and can not wait to come back for another visit! Thank you!! Oh by the way... loved the fact that there was salt, pepper and some other things supplied to this unit. VERY helpful. November 18-25 A402 at the Waipouli Beach Resort... AMAZING! The room was amazing, super clean and fully furnished with everything a family would need while on vacation. The views are stunning and likely the best in the resort with both bedrooms, living room / dining room having amazing views of the beach and ocean. The ONLY suggestion I would have for the room itself was to upgrade the coffee maker, a Keurig machine would have been perfect! The resort pool is the perfect place for all the kids as it has two very nice slides and is only 4 feet deep with a "lazy river" running around the outside making for a great place for the kids to play. The property needs a little TLC as the stucco finish was falling off in more than a few places so some "patch and paint" is definitely needed to maintain the beautiful property. Overall I would absolutely stay in the resort again and would HIGHLY recommend room A402, its really a gorgeous room. We have stayed in this condo a couple of times now. We love the unit and the view. Great location to see the entire island. Planning on staying there again in the near future. We had an excellent stay in Waipouli A402. When we walked in the view was amazing. The unit was clean, had everything you would need and the convenience of Safeway across the street was a plus. The location and size of the unit is perfect. We would sit on the main lanai early morning to photograph the sunrise and drink our coffee. On several days, we found a spot on the beach under a tree and parked ourselves on chaise lounges. I walked the shoreline with the waves on my feet while my spouse read his kindle. Since we had just spent 5 days elsewhere on the island , Waipouli was primarily for relaxing and it worked its magic. We had the pleasure of seeing Aldrine Guerrero and Aaraon Nakamura, ukulele extraordinaires, perform one evening at the on-site restaurant while having cocktails and dinner. Our server, Henry, was awesome and the meal was very good. The day before we left a Monk Seal arrived on the beach and decided to stay and sun him/herself all day. Really cool! All the Kauai Exclusive Management staff we dealt with from beginning to end were professional and helpful. The only problem? We had to leave! Would return to A402 in a heartbeat. Everything about this Unit was top notch. Impressed with the cleanliness of the room as well as the amazing views. We felt right at home and loved the kitchen and the convenience of having a full kitchen to cook our meals. The pool and hot tubs were beautiful and kept up very nicely. We look forward to our next trip to Kauai and will definitely grab this Penthouse unit again!! The condo was great! Everything worked great, beautiful views, great little beach, etc. couldn't have asked for a better spot. Everything as described and expected, in some ways exceeding expectations. Smooth booking process with excellent communication. Great concierge with spot on recommendations, adding to a fabulous vacation. The rental property being maintained to a high standard with excellent facilities made our stay very comfortable, home from home. A piece of Heaven on earth!!! Our penthouse, A402...DID NOT DISSAPPOINT!!! It was everything the description said it would be and more! Falling asleep to the sound of the waves crashing on the shoreline was amazing! Enjoying breakfast on the lanai each morning was such a treat! The kitchen was beautiful although we didn't cook much, we WERE on vacation :) The bedrooms/bathrooms were extremely roomy! I will def. be back and I will most certainly book this condo again. We were more than satisfied with our accommodations and I was very impressed with the professionalism when dealing with Pattick and Sherry! Thanks for a wonderful trip....Mahalo, until we meet again!!! Our stay at the Waipouli Beach Resort was fabulous. We have stayed at the resort before, but this unit was the best. Kauai Exclusive Management was incredibly attentive and helpful. Their concierge booked all our island activities for us. Very satisfied! The property was very well maintained with modern appliances, etc. Everything is kept very clean. The the grounds & pools are beautiful. All staff members were professional and courteous, especially the concierge, Sonja. We left some clothing in our room and called Kauai Exclusive Management LLC to notify them. They told us they would send our clothing to our house that same day, and were very accommodating about it. 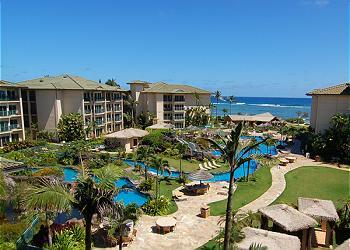 I would recommend this resort to anyone and we will be returning to it on our next trip to Kauai! We loved our stay at the Waipouli Beach Resort. The Condo unit A402 is amazing. The views are spectacular. We never wanted to leave. The Kitchen was well equipped. We had enough of everything for our needs. It is a beautiful Kitchen. It is nice to be able to see the beautiful view while making breakfast. The bedrooms: These rooms had a great views. Both room have their own balconies though the one off the with an amazing balcony. The bed is comfortable and loved the pillows. We slept with the slider open every night and really enjoyed listening to the ocean every night. The Living room: this room is functional. Based on the picture it looks like it got a much needed new sofa. I love the view and the little Joliet balcony. The beach is very close. We sat on the beach many mornings and watched the sun rise or the occasional fisherman in the water. There is a Safeway directly across the street which is super convenient. We loved the location and loved the condo. We plan on returning and staying again. 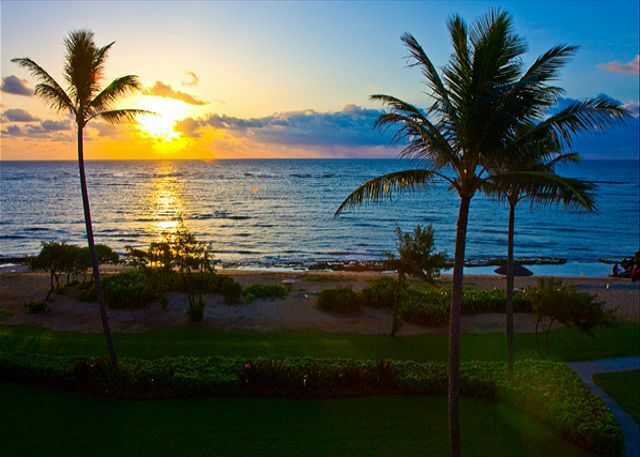 We cannot think of a better place to stay and enjoy your time in Kauai. I would recommend putting a new broom in the condo(the one there was very old and small) a few more towels and washclothes for kitchen would be nice. Everything was great and we had alot of fun with activities and just laying around the pool and ocean. Just wish the wind had not been quite so bad. We couldn't get a fishing trip in. The Waipouli Beach resort is the perfect location and A402 had an absolutely perfect view. I am pretty sure that we had the best view in the complex. All of the appliances and fixtures were high end and the condo was equipped with everything that you could ever need. We will be returning in the future and I will be re booking A402. This was a fantastic condo. Better than my expectations. The unit feels much larger than the pictures or diagrams. We woke up to a beautiful sunrise over the beach and Pacific Ocean every morning. The beds are comfortable and the bathrooms large. The resort pool is large though not deep and has 3 hot tubs. The location is convenient to shopping and good restaurants. The unit has wifi and there is a big screen TV in the living room and both bedrooms. My only very minor complaint is that if you want to stream video to the TV, you can't access the HDMI ports. If you want to do this, bring a VGA adapter. However, there is a DVD player with each TV. Also note that the resort restaurant, (which is quite good) closes at 9 PM as do most restaurants on the island. Anyway, rent this place, you won't regret it. This beautiful condo was a great start t our stay in Hawaii. We all enjoyed the huge pool and onsite restaurant. The property lived up to its description. The location was in a part of the town that had essential amenities and was still laid back as a beach town should be. Our unit was awesome for sunrise and sunset. The grounds and property is beautiful and well maintained. Check out time was difficult being 10 AM but we managed. It was the most expensive place we stayed in during our 4 island trip but we saved it for last and went home very relaxed. We had a lovely 4 night stay here and woudl rent this space again. Our Waiter Henry at the Oasis grilltotally pampered us during our honeymoon dining experience. It is a great location for exploring the rest of the island. The Bean coffee shop across the street had superb coffee. We loved our Liko Cruise up the Na Pali Coast. We also had a great couples massage on site. The only aspects that could have been better were the air conditioning in the second bedroom and the addition of some fun games for guests to use. Also the hotel computer lounge closed at 5pm which was a problem when our condo on the Big Island had the roof cave in and we needed to find last minute accomodations. Over all though this place was a fabulous honeymoon retreat! We had a great looking room, everything was catered to. The room has a fantastic view, no one will be disappointed with the sunrises and sunsets. Extremely clean and we'll maintained. Highly recommend this apartment. The concierge provided was not used as it was off site, which was the only pain point for me. Penthouse A402 Beach Front Top Corner - Beautiful! This Condo is as advertised. It has ocean views from every single room. A great patio with table and chairs where we ate almost every meal. The resort itself is nice and has a great pool area for children. We loved the condo which was fully stocked with all the kitchen utensils you will need as well as beach chairs and mats to use while touring the beautiful island of Kauai! I would definitely recommend this condo. Lastly Sonja was extremely helpful with local advice and even helped us book 3 excursions! Thanks again and hope to get back soon. I will definitely be back! The extra price for an ocean view is TOTALLY worth it. Listening to waves while sleeping is amazing. The staff was fantastic. A special thank you to Patrick, Sean, and Sonja. They all went above and beyond to make our vacation special. Sean even purchased a fan when we asked if there was an extra fan available! Gorgeous view - even keeps a 3-year-old totally occupied watching the waves first thing in the morning. Beautiful unit with kitchen upgrades. Sofa & Chair are tired. The pool with slides and spas were great. Thoroughly enjoyed the on-site restaurant - Oasis on the Beach. We absolutely loved our stay in paradise. But I wanted to give a helpful review. There were seat cushions that were worn and the outside cushions were dirty. This condo is sooo fabulous and you pay for that so the seat cushions and pillows should be fixed to reflect that. Otherwise we couldn't have had a better location and hope to come back. I can't imagine staying anywhere else!! Loved our penthouse stay! Felt like the best location on resort. Condo was gorgeous, clean, spacious, and well equipped. We loved the location on the property and on the island. It was easy to head north or south for activities. We also immensely enjoyed out own beach and pool. It was very clean, except for the dish washer. The dishes did not get clean so we checked out the filters in machine and discovered they had probably never been cleaned. We cleaned them and the dishes were clean after that. All the knives for slicing were so dull they were unusable. Now what we loved. Location was fabulous. Loved the view from the balcony. It was clean overall. I would absolutely stay in this resort again. We stayed at the Waipouli Beach Resort in unit A402 over Thanksgiving this year. We purposely selected a location on the east side of the island for its convenience to activities in the north and south. We knew in advance that the beach was not a swimmable beach and planned that we would swim in other areas. The location was convenient to a grocery store and a number of restaurants. Josh and Patrick were both great to work from the point of booking even past our checkout time. The unit was very clean and had all the necessary essentials. The kitchen was also very well equipped having a number of small appliances, pans, etc... The views from this unit were OUTSTANDING! We took our two children for their first visit to Hawaii and they were facsinated each morning to wake-up and watch the sunrise right from our room. The unit itself was very clean and had nice furnishings. The resort was also in good shape with the only minor downside being the pool water was extremely cold and you couldn't take an inflatable on the lazy river in the pool (not sure how that makes it a lazy river.) But, these were very minor issues and didn't impact our stay. Plus, we were there in November so we expected a bit cooler temps. We especially appreciated Josh providing us a base camp location on the day of our checkout since we checked out in the morning and didn't fly out until later that night. We were able to enjoy the full last day knowing we could catch a quick shower before heading to the airport. That was a huge bonus for us as a family and something that would set this company apart from others we have worked with in the past. We would definitely stay here again and would recommend it to others as well. Thanks Kauai Exclusive for a great vacation! Nothing could have been easier from reservation to check out. All details perfect. Great location for getting around the island and away from crowds. The condo was great. The view and was fantastic. We really enjoyed ourselves and hope to return to the same condo next year. A taste of heaven in Kauai! From the initial contact with Jackie the rental was Fun, Safe and Easy! The condo was AMAZING! The view was spectacular, well that's if you enjoy having an oceanfront condo, sitting on your lanai having your morning cup of Kona coffee watching the sunrise. If you are having trouble sleeping in the super comfy bed with great pillows I suggest opening the sliders and listening to the sound of the surf, ahhhh! The condo has everything you could imagine in a vacation home spices in the cupboard, great pots n pans, cooking utensils, nice wine glasses, lots of ice in the sub-zero and more. Beach chairs, boogie boards, keyless entry, steps away from the beach, with farmers markets, shopping, bike rentals within walking distance. The grounds at Waipouli are very well kept, I've never seen a cleaner pool! Best of both worlds with the beach and the pool or the work out room overlooking the pool. We were too busy take advantage of the spa but it looked inviting. Originally I thought I wanted to be on the 1 st floor but after staying here and the Amazing views from above we are glad we chose the penthouse. From the day we made our reservation, until the time we returned the rental car, our experience was nothing less than pure perfection. Sherri at Kauai Exclusive Management was always available to answer any questions, as well as to attend to the smallest of details to make our vacation as perfect as possible. We had an amazing time in your unit. We had a slight issue with the stove top our first day, but it turned out to be a very small in convenience and it was handled wonderfully by the maintenance crew. I would definitely revomend you to a freind and have already. We would definitely do budiness with you again. We loved Kapaa and alll that is going on there. We have owned a timeshare on Kauai and always extend our stay over our one week that we own. The rental company was great and confirmed everything with us in advance we will use them on every trip. So much better than doing it on your own and I am a realtor! !Josh was the best very professional. We had a wonderful time at this condo. The view is very nice with beautiful sunrises almost every day. 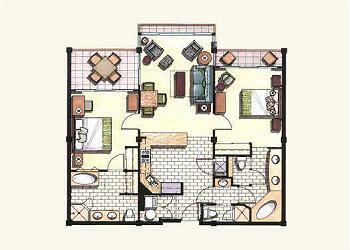 The condo is very well appointed with top of the line appliances and large bathrooms/showers. Being on the 4th/top floor you have very good privacy and isolation to simply relax and enjoy the view. One thing to be aware of, the local beach is not recommended for swimming and snorkeling; however, they have a very nice/large pool/slide/hot tub setup on the resort grounds. If you want good snorkeling, you will want to find some of the more remote areas on the island anyway, such as Tunnel's beach. You will definitely want to go to Waimea canyon and we enjoyed a zipline tour during our stay. We tried a Napali coast tour but did not actually get to see the coast due to weather. We are serious Hawaii travelers. We always rent a place for two couples, on the ocean. Our unit was exactly what we look for, with two master bedrooms each with a first class attached bath, beautiful top floor ocean views, and a clean high quality kitchen and living area. I can't speak for all the units, but our unit # A402 was first class and meet our expectations. The resort was equally as nice. To put into perspective. 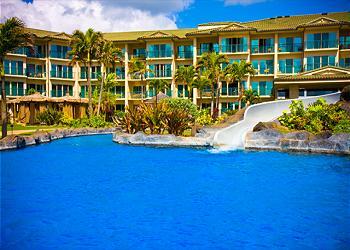 Over the past few years we have stayed in similar condo units at Ko'Olina in Oahu and Honua Kai in Maui. We had a great time and wonderful stay. The condo was clean and in a wonderful location. we'll be back next year! We loved our condo! It was comfortable, well appointed and had amazing ocean views from every room. We didn't do a whole lot of cooking but I did make a few breakfasts and found the kitchen to be very well appointed. The restaurant on site, The Oasis, was wonderful and we ate there twice. The only downside to this property is the "un-swimmable" beach. If your plan is to plant yourself at a resort, this may not be the place for you. We drive around and explore so it wasn't a major issue for us. The pool is nice but we had trouble getting lounge chairs. Their was one person working the towel hut and we did have trouble exchanging towels for dry ones, so ended washing them our selves every night. A Glorious Month in Kauai!! We spent the last two weeks of March thru the first two weeks of April at Waipouli Beach Resrot A402. It was one of the best Hawaiian vacations we have had, and we've been to all the other islands before. The room was magnificent, but what really made our trip truly special was the crew and the food at the Oasis on the Beach! Wednesday Happy Hour with the entertainment is not to be missed. Thank you Kauai Exclusive for one of our best vacations! Hopefully, we will be back in September. Best rental condo in 50 years! Absolutely loved the condo, view, location and resort. The best we have rented in our 50 years of marriage. The unit has obviously been professionally decorated, with unbelievably painted walls we originally thought was wallpaper. Great location. Fantastic view - best in the complex over the water! Close to the elevator. Located in the middle of town with restaurants close and a shopping center across the street. A lot of kids and a lot of fun things for kids to do for the families, yet as an "older couple", we felt it was not too loud or over-run with little ones. An outstanding place! Great condo with the best location on the island. We had the patio doors opened 24/7 nice breeze blowing in. Condo has everything u need. Josh and staff went out of the way for my daughters who dont like to sleep together and put an air bed in the kids room so they could each have their own space. No worries renting with Kaui exclusive very professional. Shower very dark in unit. Only one of the two adult hot tubs worked during our 9 day stay. One adult had major issues when our 14 year old daughters joined us because regular hot tub cold. She wanted an 'adult experience' and did not want me to let them use it. She stormed out. Can't have a circus without the animals. Great location. Beautiful condo. Ten days went too fast! Hope to return to same condo in the future. Great room with an oceanfront view. We were very pleased with the room and the resort. Since we already had the room keycode we were able to skip check-in and go straight to the room. Everything was very clean and extremely nice. The room was in a great location to be near the pool, but the room was angled away from it so we never heard any pool noise. The lanai was ideal for enjoying meals and listening to the waves crash on the beach. Overall the resort was high quality and so was the room. We could easily recommend A402. We stayed for over a month. Paradise. Very high quality unit and property, great and responsive management. We would definitely rent this unit again, we would definitely stay at Waipouli Beach Resort again, and we would definitely work with Josh and Kauai Exclusive Management again. A+++++++++ all the way in all. Beautiful luxury condo with wide ocean views and sound of the surf, convenient location, and professional, responsive mgmt by Josh. Resort has a lovely bar and restaurant right on the beach, and a huge pool. A winner. The resort and condo was amazing! The bedrooms and bathrooms were very large and beautifully decorated! The kitchen was equipped with upgraded appliances. The best part was the incredible view!!! I highly recommend this property! I have been going here for several years and I keep going back! I just can't say enough great things about this place! I feel "at home"and this is the perfect spot to escape from any stress related to work! This is a true paradise! Thank You!! We relly enjoyed this property. The view an location was amazing! I wish we had stayed here the entire time instead of staying 4 nights in the Poipu area. Only wish the drive was closer to north shore. Only thing could say that might need improving is sharpening the knives in the kitchen! It was a wonderful spot and would highly recommend it! Would love to know if Kauai Exclusive Mgmt. has any properties like this further north? This was our 3 visit and we love everything about this unit. There is a light in the bathroom that needs a cover, some of the none stick pans for cooking need replacing, and there seemed to be a shortage of batteries for the remotes. All said, we loved our stay and will be back. P. S. The elevator still makes the same unnerving sound as last year. We had a great time. Everything was as promised. A relative that lives on the island came to visit us while we were in the condo. He stated, "What you couldn't find a nice place to stay?" This condo in our opinion, and his, is one of the best places to stay on the island. Easy access both north and south and plenty to do around it. Certainly a place this traveller would come back to. Beautiful resort and Amazing room! Waipouli resort is excellent and our room was perfect. Our room A402 was very clean and well equiped, the beds were super comfortable and the linens were so soft! The view was amazing! We woke up to the ocean sounds and a beautiful sunrise everyday. We loved watching the whales from our lanai! Kauai Exclusive was so easy to work with, we knew exactly what to do when we got to the resort to get into our room. And Josh was on top of everything...our blender broke and soon after we emailed him he replaced it with a brand new one. The resort is centerally located so it is convenient to explore the island in either direction. There is a grocery store and places to eat close by so we could walk or drive to them. The beach in front was very relaxing and clean, it was nice to have lounge chairs provided. The pool was very nice and although we didn't have children with us, the children we did see seemed to love pool and waterslides. There is an adults only hot-tub and that was very nice. I definitely recommend this resort to families and couples! This was one of the most relaxing vacations we have had with our 20 month old son! The condo was perfect and very comfortable with more than enough room for the three of us. The view was perfect and the ocean and breeze was wonderful to wake up to every morning. The pool area was great for little ones and we loved the waterslides! Right across the street there is everything you need, groceries, drug store, Starbucks, etc. I would definitely recommend getting an ocean view as the mountain view looks out onto the parking lot and the shops with the main island road right outside. We will go back and stay in A402 again! Great location - we drove the entire island and loved the amenities in this area as opposed to staying down in Poipu Beach. It was easy for us to get milk/diapers last minute which was great and there are a lot of restaurants in the area. We also booked our crib, wagon and backpack and found a babysitter which made our trip hassle-free. Thanks for everything!! Condo is just like the pictures. We slept every night to the sound of ocean. It was so wonderful to wake up to a beautiful sun rise while enjoying a cup of coffee. The location was great as you are close to the North and South ends of the island. Safeway is accross the street but we actually preferred Food Land (about a block south)for grocery shopping. We can't wait to go back. My husband and I absolutely loved staying at A402 in Waipouli. We will for sure stay there again if visiting Kaua'i. I will say that from the pictures I worried the furniture might be a little cheesy, but I figured most of the time at Island condos - cheesy is what you get. I could not be more wrong! The furniture was lovely. The beds were super comfortable and the sheets had high thread counts (thank you!). And as a cook, the kitchen was FANTASTIC. Also, huge thanks to Josh for helping us out on our arrival day. It was the perfect vacation! A402 definitely exceeded my expectations! The stunning 3 waterfront balconies in the condo were the highlight for me. The furnishing were great too (everything good+ quality), and I enjoyed the fun purple (well done) master bedroom decor. The shower head in the master bedroom bath could be improved and there was a hiccup in the keyless entry one night (that was quickly solved by Josh). Overall, the condo was gorgeous and it was hard to leave it to explore Kauai! Property was listed as sleeping up to six. No way? Showerhead in one of the bathroom had to be replaced. Wasn't repaired til the next day. Otherwise very enjoyable stay. This was our third stay at Waipouli Beach Resort. It was a wonderful time in beautiful unit A402. The ocean breeze and sound of the surf was spectacular. The unit was clean and extremely comfortable for our family of five. Thank you again Josh for accomodating us on another great visit to Kauai. Thank you Patrick for moving our luggage and groceries when we moved from H302 to A402. We look forward to visiting again soon! This condo/unit was so beautiful and perfect for us. Plenty of room and the view is amazing. Very clean and had more amenities than we certainly needed. Beds were comfortable, everything worked well and the location was perfect. The resort itself is great too, very nice staff and the grounds are well kept. The only complaint is that the restaurant in the resort (The Oasis) is very, very upscale and that kinda turned us off. We were disappointed in the fact that the poolside grill/bar was closed and is now the "kitchen" for the restaurant. Very odd. The staff wheel carts back and forth from this "kitchen" to the actual restaurant. We didn't understand why they made that decision. You can still bring food/drinks out to the pool though, so it wasn't an issue. Also, there were no carts to help with your luggage or groceries from your car to the elevator, at least in our building. It was very convenient to have Safeway across the street and so many good restaurants nearby in Kapaa. We loved our family vacation in Kauai! The view from our condo was amazing. Breakfast on the lanai was a delightful way to watch the sunrise. Whale watching was an added benefit - everyone in the family saw a whale breach! The walk to the beach was leisurely, and we immensely enjoyed the pool. The unit was wonderful, the general area like the carpet in the halls, elevator needed cleaning. The elevator also seemed like it needed some maintence, we had a few issues with it. Love the view. Waipouli Beach Resort is tops in every way,and we had a great time there. The only thing we'd like to see improved in the unit we were in (A402) is the lighting. We are avid book and magazine readers. This unit needs another lamp or two and brighter bulbs. The owner can easily correct this,and we hope he will. Our family of 5 were very comfortable in this well equipped condo. The location was great. Going to the North Shore, Poipu, Waimea Canyon, took 30-40 minutes. Kids loved the koi pond, pool, hot tubs, and slide. Staff was friendly even though we were not hotel guests. The concierge even helped with restaurants and taxi. Joshua from Kauai Exclusive Mngt was super to work with. We would stay here again. We found the Waipouli Beach Resort and our particular unit A402 to be very comfortable and would most definitely stay there again. The convenience of a keyless lock system on the door and automatic air conditioner shut off when the patio doors are open was genius. The only suggestion: better & adjustable shower heads in both showers -not enough water pressure to clean through thick hair! 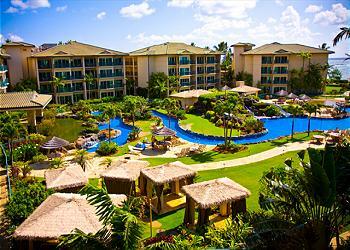 The resort is a complete package (landscape, pools, hot tubs, walk paths, eating and ocean front. )The room was 1st class all the way with all the newest accomidations. Fabulous vaccation. We would definately stay here again! Only negatives - not enough light to read by in the evenings. Not enough hot water to fill the jacuzzi tub. 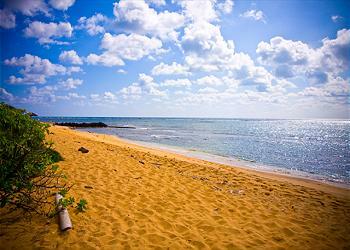 Waipouli Beach Resort is ideally located on Kauai's east coast in Kapaa. Great central location for day trips north or south. Plenty of dining options are nearby, from Mickey D's to the chic and eclectic Oasis (right below unit A402). Unit A402 is squeaky clean with ultra-modern appliances, and it has a spectacular ocean vista, with breathtaking sunrises from tine three lanais. No need for a/c, as the breeze off the ocean provides all thie ventilation and cooling you will need...but it does have air conditioning if you feel the need! You will be lulled to sleep by the sound of the surf. The best place on Earth! The best management company on Earth! I realized I did not have the code to get in the door when I was still en route and waiting on the mainland. I contacted the resort, who sent the information to my cell and EMail account. This was great sevice! Beautiful location!! Needs a rice cooker. Thank you!